Elbin Salamanca-Architecture - BECA. The BECA.org Foundation. Empowering Youth Education in Nicaragua. 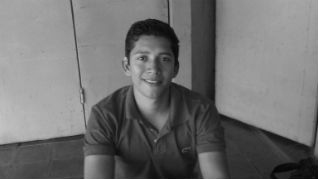 My name is Elbin Antonio Salamanca Sierra I live in Niquinohomo Masaya, I am a 25 years old. Thanks God for giving me the opportunity to grow on a humble and hard worker family, since i was a little kid my parents show me good values that help me a lot. I am a young man with big dreams which I have been achieving thanks god. Throughout my life god has given me too many opportunities first of all the most important thing being part of BECA.org, around 5 years ago approximately I found a friend that inform me about the foundation and invite me to apply for a scholarship, I was so excited and went to the main office so I found young people that motivate and indicate me all about the process of getting a scholarship. One of the coordinators visited my house and told me that I have to go to the office in order to confirm if I was selected to be part of the foundation, once I got there I was on the list. First of all I took course one which was a computer course, it was difficult at the beginning but then I got used to the environment, classmates, then I went to the next level on which I worked with a elementary school in order to support teacher and students for three months, it was an amazing experience but then it was so hard to say good bye, I was also proud of me because I had finished. Then I had to choose a technical career. I decided to study architecture for three years at INTECNA-Granada, every day I learned something new, on my last year I was so happy because I was about to get my title, I start offering my practices with a company called ECOMUN in Nindiri-Masaya, it was a little hard but I was able to graduate with the support of my family and BECA.org that support me since the beginning until the end. Well I am working with the same company they gave me the opportunity to work with them, everyday I work so hard and learn new things and I have dreams which are the most important, as well I am so grateful with my family and God because without their help it would not be possible. I am so grateful with BECA.org now HEDU.org, I want to say thanks for your friendship and good moments that we spent together which will be in my mind forever, in conclusion I invite all young people that work hard every day in order to achieve their goals because if I could you can do it as well and the most important thing put God in first place.